Every family experiences potty training highs and lows, but it can be especially challenging for parents that work outside the home. Whether parents are working full-time or part-time, most can’t be with their children every time they need to use the bathroom. Check out the following tips to help you and your child prepare for potty training, even while you work. 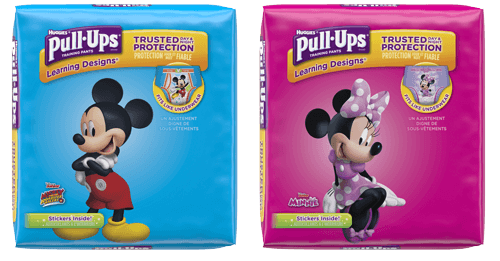 “The most important part of potty training for parents who work is to use communication, cooperation, collaboration and consideration as you work with your child’s caregiver,” advises Pull-Ups® Potty Training consultant Jan Faull, M.Ed. Remember that it isn’t a competition. If your child care provider initiates the training, or if your child shows interest when in their care, go along with their suggestions and approach. Be sure to discuss the potty training process and technique with your childcare provider to ensure you are on the same page, that way there won’t be any surprises when it is just the two of you. “Be open with and listen to your provider, he or she has likely taught many children to use the toilet. Their expertise will guide you. After all, if this is your first child, potty training may be one extra stress you’re not eager to take on. A person such as your child’s caregiver can offer you support as you guide your child to use the toilet at home,” advises Faull. As your child works toward using the toilet, talk each day about his or her successes and setbacks with your child care provider so the potty training approach remains consistent. If you don’t have a chance to discuss face-to-face, create a daily potty log book both you and the caregiver can enter information in. This way, you can each see the success or setback and how it was handled or rewarded, as well as track time spent trying. “Talking about a child is a form of attention and reinforces their behavior. Therefore, talk up potty training triumphs, but when it comes to challenges or stumbling blocks, discuss these over the phone when the child is not in ear shot,” says Faull. And, “If your child is using the potty with the caregiver and not at home, remember that it isn’t a competition. Don’t feel like you are doing something wrong. Stick to the plan and the child will get it at home soon, too,” advises Pull-Ups Potty Training consultant Laura Bennett-Murphy, Ph.D.
Keep in mind that potty training can be frustrating for child care providers, especially ones that care for multiple or multi-aged children, so be understanding and considerate of the potty training troubles they face. If your child has lots of accidents in the child care setting, be sure to provide extra Pull-Ups® Training Pants. Or when your child goes from Pull-Ups® Training Pants to underwear, it’s a good idea to pack extra underpants and clothes as well just in case; it will really be appreciated. Above all else, “Make sure that you get the potty report as soon as you get home so your child knows that their accomplishment means a lot to you. Follow up with the child to give them a big ‘I’m so proud of you’ hug,” says Pull-Ups Potty Training consultant Bernie Dorsey. It will go a long way to help your Potty Partner succeed and feel like a Big Kid.